Wiper blade single part. Fit to al older wiper types of the Trabant 500, 600 or 601 (does not fit to CZ models). 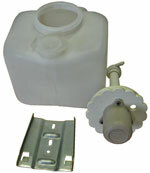 The windscreen wiper kit consist of two pieces of wiper arms and two pieces of wiper rubbers. Late type with conical mounting clamp at the wiper linkage. Wiper blade as single unit. Consist of an metalframe and an wiper rubber. Fit to Trabant 601 and 1,1. Good reproduction made in EU. Complete wiperblade, consitst of metal carrier (black) and wiper rubber. Fit to all Trabant 601 and 1.1 front wipers. 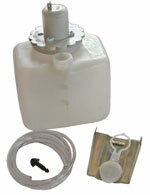 Ideal for upgrate the mechanical hand pump into an electrical system.